(Ramsey, NJ) — Law enforcement officers from the Ramsey Police Department will join with police from around the country in cracking down on unbuckled motorists and passengers as part of the national “Click it or Ticket” campaign. Beginning May 21 and running through June 3, the annual “Click It or Ticket” national mobilization utilizes high visibility seat belt checkpoints and saturation patrols, in combination with local and national publicity efforts, to reiterate the life-saving value of seat belts. Poedubicky added that a key focus of this year’s campaign is to promote seat belt usage by adults in all seating positions in the vehicle, both front AND rear seats. The front seat belt usage rate in New Jersey currently stands at 94.07%. However, adults riding in rear seats are buckling up at a significantly lower rate, only 48% in the most recent survey. “For whatever reason there seems to be a disconnect with people feeling they don’t need to buckle up when riding as a passenger in rear seats, and this is a concern,” he said. During the 2017 “Click it or Ticket” campaign, 350 New Jersey police agencies participated in the two-week initiative. As a result of the effort, law enforcement officers issued 17,792 seat belt citations, 6,363 speeding summonses and made 976 impaired driving arrests. PEARL RIVER, NY, March 10, 2018 3:30 p.m. — To help support and accelerate electric system emergency repair and service restoration in Rockland and Bergen counties, O&R today is deploying key emergency repair materials and equipment to a temporary staging area on the grounds of the Sheraton Mahwah Hotel in Mahwah, NJ. Thousands of feet of wire, dozens of poles and transformers and other equipment are being transported this afternoon to the site which is centrally located to most of the current storm damage to the electric system in Rockland and Bergen counties. The staging area also helps accommodate the additional influx of mutual aid overhead line technicians O&R expects to report for duty later today and tomorrow. About 220 additional mutual aid overhead line technician joined O&R’s repair and restoration effort today. Another 250 mutual aid overhead line technicians are expected to join the O&R field workforce by Sunday. All those technicians, and more, are working to help O&R restore service to the 8,500 customers who remain without electricity as a result of destructive, back-to-back nor’easters. With the support of additional mutual aid assistance, O&R is aiming to complete power restoration in Sullivan and Bergen counties by midnight Sunday night and also expects to have the vast majority of Rockland customers restored by then. When the new group of 250 mutual aid line technicians begins work Sunday, it will bring O&R’s field force of line, tree, single service, damage assessment and site safety personnel to approximately 1,200 – representing the largest restoration contingent O&R has deployed to the field since Hurricane Sandy. While O&R focused on completing substantial and widespread tree removal and line repairs in Sullivan County, NY, the area hardest hit by Winter Storm Riley’s damaging winds, a second nor’easter moved through the service territory. That second storm, Winter Storm Quinn dumped over a foot of heavy, wet snow, which downed trees onto poles and lines. Winter Storm Quinn caused the greatest damage in Bergen County, NJ, and Rockland County, NY. Be especially mindful of the potential for downed lines to be buried beneath snow. Put your safety and the safety of your children first at all times. Maintain a distance of at least 50 feet from downed wires and anything they are in contact with, including puddles and fences. Never touch or approach any downed wire. Assume it is energized and dangerous. Call O&R immediately toll-free at 1-877-434-4100. Depending on the situation, you may also want to call your local police to divert traffic until an O&R crew arrives. If you experience a power outage, don’t assume that O&R automatically knows about it, or that someone else will report it. Also, notify the company if power is restored to your neighborhood, but not your home. All outages and safety concerns should be reported immediately. For more information, visit O&R’s Storm Center at www.oru.com. On Tuesday November 1, 2016 at approximately 9:25PM, a man was robbed at gun point and assaulted as he was walking in the vicinity of Orchard Place and Summit Avenue. The victim was walking and making telephone calls, when a Honda or Toyota typed vehicle with a loud muffler, passed him on Orchard Place. The actor asked the victim for directions. The victim then began to run, due to his knowledge of previous street robberies in Ramsey. The victim was then attacked on a front lawn of a Summit Avenue home. The actor reentered his vehicle and headed south on South Central Avenue, towards Allendale. The actor was described as an a dark skinned, tall, skinny with dread-locks, wearing a cabbie cap and spoke with a heavy Spanish accent. The handgun was only described as dark colored. The proceeds of the crime was and IPhone and prescription medication. The actor meets the description of previous cell phone robberies that occurred in last summer. The Ramsey Police Department urges the public not to use cell phones outwardly on the streets after dark. Parents are also urged to reinforce this with their children. If anyone has any information on this crime, please contact the Ramsey Police Department at 201-327-2400. The Ramsey Police wants to thank Mayor Dillon, Council President Vanessa Jachzel, Councilman William Jones, Councilman Ken Tyburczy, Councilman Harry Weber, Councilman Joseph Verdone, Councilman Peter Kilman for their continued support! 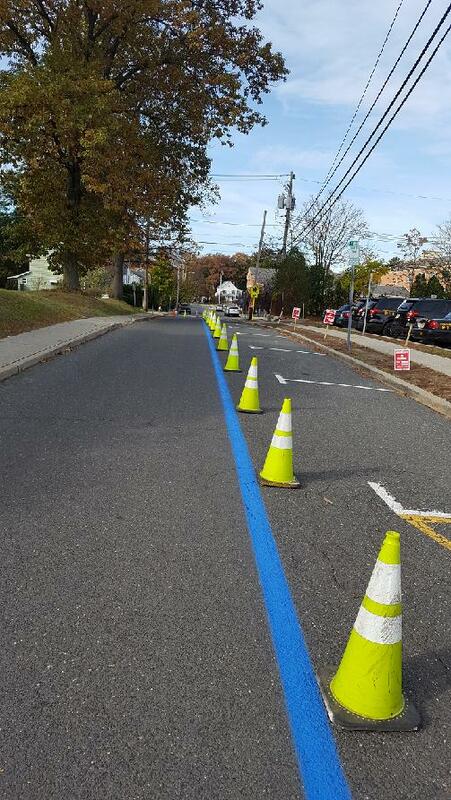 The governing body recently approved the Thin Blue Line being painted on School Street as a sign of their continued support and the support of our residents! On Wednesday October 26, 2016 at approximately 2:50PM, the Ramsey Police Department was dispatched to the Peach Hill Townhouse Community with regard to an unconscious person. Upon arrival it was determined that a tree service worker was struck with a large part of a tree. The tree service was hired by Peach Hill Townhouse Community to perform tree work on the property. The worker was a 30 year old husband and father of two from New City, New York. Members of the Ramsey Police Department and Ramsey Ambulance Corps administered first aid to the worker/victim for upper body and head injuries. The worker/victim was transported to Good Samaritan Hospital in Suffern NY, where he was pronounced dead at approximately 3:35PM. The Bergen County Sheriff’s Bureau of Criminal Investigation and representatives of the Occupational Safety and Health Administration responded to the scene. The matter continues to be investigated. Be advised that a 14 year old high school boy was walking south on N. Central Ave. at 8PM on the evening of October 11th when a white SUV-type vehicle stopped and asked the boy for a ride. The driver identified himself as a varsity coach at the High School. The boy was shown last year’s Ramsey HS yearbook and could not positively identify any of the coaches. Schools have been contacted. I am going to post this on our website and Facebook page. I have asked the schools to do the same. Please be mindful of your surroundings. If you suspect something isn’t right, call the Ramsey Police at 201-327-2400. Ramsey Police Department Installs New “Project Medicine Drop” Box to Help Residents Dispose of Unused Medications, Prevent Prescription Drug Abuse. Due to impending inclement weather, the 2016 Memorial Day Parade has been cancelled. The Memorial Day ceremony will be held at the Ramsey High School auditorium at 11am. Sorry for the inconvenience. Have a great weekend and support the men and women serving our country! -Several victims from Ramsey have recently been the subject of an apparent “rental scam” where the actor/suspect pose as the landlord of a particular residence, and advertise a specific property for rent – either on Craigslist or Trulia. -This “landlord” will correspond with our victim (who responded to the rental property advertisement) via e-mail and requests money (usually between $500.00-$1,000.00) be sent to the “landlord” via Western Union in order for the “landlord” to send the renter/victim the key to the residence. The “landlord” asks for the money as a form of commitment from the renter/victim. The “landlord” will also ask that an application be completed by the renter through e-mail. Photographs of the rental property will be posted on-line in the advertisement. These photographs will come from an actual property which is already listed for SALE on the internet. The “landlord” obviously never meets with the prospective renter. The “landlord” also claims that he/she has moved to another state for work, which is the reason for renting the property. The grammar from the “landlord” in the e-mails is usually poor. -Please consult with a real estate attorney or realtor prior to sending money to an unknown person for a rental property. If you are a victim of a scam please contact your local police department. The 2015 DARE Culmination will be Thursday June 11th 7:00pm @ Ramsey High School.